Did not Jesus change his mind? At first, he had no time for this non-Jewish woman, although he did find time for a half-Jewish woman in Samaria. Not only did he not have time for her, he compared her to an animal. If he's not being racist here or sexist, a product of his Jewish patriarchal upbringing, he's at least being nationalist. But her faith in him produced a change in him. "Whoa!" you say, "Jesus doesn't change. He was just calling her a puppy, not a dog. It's playful banter...or...or... He was setting an example for the disciples, he was tricking them to make a point." The first point is weak from the Greek, even less so when we don't know what language they were using, Greek, Aramaic, Latin? The second point is even weaker, because who wants a Jesus who lies to his disciples? The writer of the New Testament letter, Hebrews, offers another option. Hebrews 5:8 Even though Jesus was God’s Son, he learned obedience from the things he suffered. See that? Jesus learned. What did he learn here? In the context of Matthew 15, two things: 1) ritual purity over compassion is unacceptable to God and 2) ideology blinds us to our suffering neighbor and exempts our self-centered friends who do the same rituals we do. What is the result of Jesus' repentance? He repeats a mass feeding from seven loaves and a few fish of 4,000 non-Jewish men as well as women and children. He did a similar miracle for over 5,000 Jewish men and women and children. 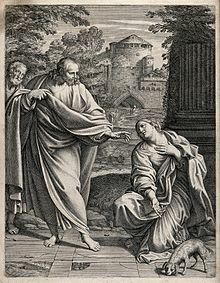 But Matthew and Mark, are the only gospels that have this story about the Syro-Phoenician woman immediately followed by the feeding of the 4,000. * Jesus' learned obedience and his ministry expanded. Jesus learned God's lost sheep were not just Jews or half-Jews, but all humanity. This story was extremely important for the young church as it outgrew it's Jewish heritage as it also learned the good news was for the entire world, not just the Jewish world. My country, the USA, also needs to repent of its racism and nationalism. My battle is not against Donald Trump, but against this demonic milieu that he continues to campaign on, America First, also known as, White nationalism. Ten years ago, I was sharing posts on here condemning illegal immigration and arguing why they should be sent back. What I did not consider at the time was any sort of compromise. DACA is one proposed by the previous administration, amnesty for those who were brought into this country as children. I'm all for amnesty now. I've changed my mind.I learned obedience to welcome the stranger, the orphan and the widow. I've repented. I've just joined a local organization called Start Fresh which helps resettle refugees in Southeastern Connecticut. It's part of a Connecticut Network based in New Haven called Integrated Refugee and Immigrant Services (IRIS). Both of these groups are humanity-first organizations that are assisted by multiple social groups, not just Christian churches. The humanity they help are, almost by definition, non-white. Many northern european countries have better social safety nets than the USA and are not interested in immigrating here. This country has thrived because of immigration. My immigrant ancestors come from Germany and Ireland, neither well liked in the 19th and early 20th centuries, definitely resisted by those already here, who feared their Roman Catholicism, dirty manners, inability to speak correctly, bizarre manners, disgusting food, and refusal to integrate. I live on a street full of World War 2 refugees from Greece. My area only knew Greek pizza for decades because so many came and opened restaurants. My life is richer because of this area's inclusion, even if reluctant, of so many nationalities and ethnicities. At my job, I work with South Asian and East Asian and Eastern European as well as Irish and British folks. I'm surrounded by the accented English of brilliant hard-working scientists. An honest, historically America-first approach is an immigrant positive approach, no matter the skin color, the religion, or the language. Like Jesus, we need to repent of our nationalism. When we do, when we recover the better vision, our world will, literally, change for the better. *There is also a significance in the number of baskets picked up from each feeding as well. In the feeding of the 5,000, 12 baskets of leftovers are gathered, indicating the 12 tribes of Israel. In the feeding of the 4,000, seven baskets are collected, possible referencing the seven enemy Gentile nations of the early Jewish nation in Palestine. Deut. 20:16 "In those towns that the Lord your God is giving you as a special possession, destroy every living thing. 17 You must completely destroy the Hittites, Amorites, Canaanites, Perizzites, Hivites, and Jebusites, just as the Lord your God has commanded you."